This image was made shortly after the previous post. From the metadata, it looks to be shortly after the sun had finally set. As you can see, the sky was ablaze with some yummy color. Again, I looked for a unique rock to have as a foreground to place with the dramatic sky. For the processing of this image I had shot two frames, one for the sky and one for the foreground. Using some tools in Photoshop I was able to blend the two exposures to make something close to what I remember seeing that night. Whereas the previous post was shooting what I refer to as the backside sunset, this time I’m shooting towards the ocean into the sun. This is awesome! I absolutely love the foreground rock and of course the sky is spectacular. With the tiniest bit of imagination, the rock becomes an alien creature. An amazing image! This is spectacular! The rock is very prehistoric looking…. Always appreciate your stopping by Nancy. Thanks. Pretty amazing. 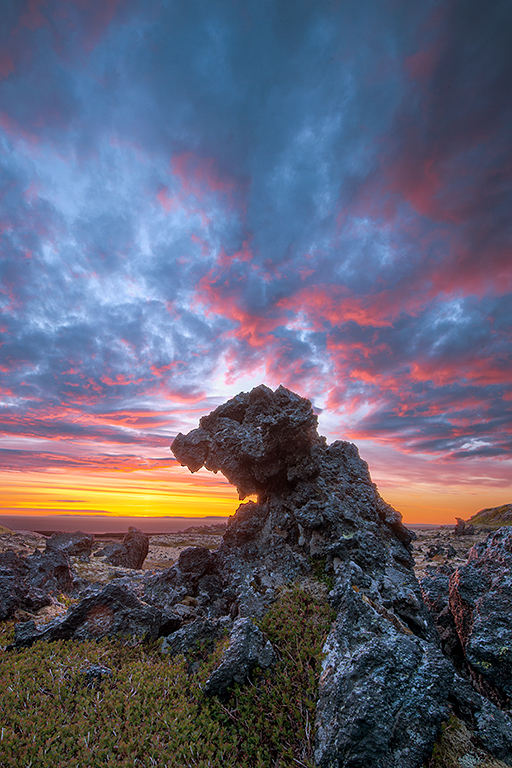 Looks like an ancient lava creature! That would have been a better title for the post! Blue Ribbon-Best in Show, in technical terms- Dang that’s pretty!! That is one spectacular image, John! Breathtaking in the way the cool foreground colors contrast with the warmth of the horizon yellows and the cardinal colored clouds. And I strongly second Victoria’s spot on observation regarding your “rock creature.” Nice touch in how you position the “head” so that it is haloed by the brightest part of the sky. Bottom line: damned well done! I’m curious as to why you opted for just two exposures to be merged in Photoshop, rather than taking a more expansive series and processing in Photomatix. I’d appreciate knowing your thinking behind that choice. But in the end that photograph is dynamite! Mostly because I’m not into processed HDR much anymore. As such, I prefer to blend images and have been learning some tricks for do so. In this case I had plenty of data with two captures, especially with my D3x files. I think a blended image is much more natural looking. Don’t get me wrong. I still used Nik HDR from time to time on certain images. Beautiful shot, John. Not as subtle as the last one but I think this is my favorite. Great job of blending 2 exposures – I wouldn’t have known if you hadn’t had told me. That should be looked at as a complement. Thanks Stan. I used some new techniques. More to come on that in a later post. It’s beautiful and the blended approach really has a lot of merit. Thanks for sharing and can’t wait to see more from this trip. Excellent image and the blending is superb. Love the color and the rock is so cool. Of course, stunning, but well composed, too. Love the balance of colors in this one, JB. Are we going to see a lot more Iceland pictures soon? Thanks Brenda. Yes, more to come so stay tuned. Enjoy your upcoming trip and Doug D. He is a kick! This image is hot – hot I tell you! In the immortal words of Adrian Cronauer: It’s damn hot! It’s so damn hot, it’s about to burst into flames! Why thank you Mr. Tom.